Is it Real, or Just Politics? Part of the unending political cycle is the parade of wannabe elected officials touting their version of “Doom and Gloom” as a reason to kick out the current crew and elect fresh new faces. And yet when polled in 2017, only 6% of Americans thought the world is getting better. The percentage of people living in extreme poverty has never been lower, Literacy is way up, health is much improved as diseases are eradicated, nutrition has improved and life expectancies are rising? Our World In Data suggests that the media are partly to blame. The media does not tell us how the world is changing, it tells us where the world is going wrong. It tends to focus on single events particularly single events that have gone bad. By contrast, positive developments happen slowly with no particular event to promote in a headline. “More people are healthy today than yesterday,” just doesn’t cut it. Apparently, ignorance is not bliss. The United States ranks as only the 18th happiest country in the world (https://en.wikipedia.org/wiki/World_Happiness_Report). Too many Americans like to claim they are miserable or feel they are fine, but everyone else should be miserable! Try living in South Sudan, the lowest ranked country on the list, if you want to know what miserable is. And, yes I’ve been there, and it is miserable. So for the next few blog posts at www.deshurkoblog.com, I will spend some time looking at real data and try and debunk some of the doom and gloom statistics that are so prevalent in the news. This is not meant to be market-oriented. But you can’t be objective about the market, or anything else if you start off with an erroneous bias. Looks pretty brutal. Debt is skyrocketing. But is that what matters? Debt is a function of the ability to pay. $100,000 of debt may be crushing to someone making $50,000 a year, but a minor annoyance to someone making $300,000 a year. So the proper metric is the ability to service that debt. Below is a graph showing all consumer debt payments divided by personal income. Sure, there are people overburdened with debt. They screwed up. People always do. Many times for what seemed to be good reasons (student loans), but overall, as a country, as an economy, personal debt is just not an issue. Another way to look at it is by looking at net worth, what we own divided by what we owe. That downturn at the end is the fourth quarter of 2018…brutal. But overall a pretty solid and consistent rise in net worth. As a nation, as an economy, our financial well-being has never been better. While income and net worth disparity is an issue, in my opinion, no one is going to close the gap by collecting unemployment and welfare checks. Below is a graph of working age Americans that are unemployed. We are at historically low levels. And finally, not only are more Americans working, but wages are once again growing at a fairly steady rate (+4%) since a sharp decline in 2015 to early 2016. Sometimes it’s best to be careful what you wish for. Sure every level of life can always stand improvement, but to base one’s life and on a larger scale, how we run our country on perceived weaknesses that just don’t exist is not a solution. There are real issues, but addressing those means separating the real from the feigned. Decisions need to be based on facts that really matter. Just a quick note that Wes Campbell CPA, President of P&A Tax Services and myself will be on Channel 7 News tonight between 5:30 and 6:30. We were asked to comment on people who don’t file but are owed refunds. And I offer suggestions on what to do with a refund. My above endorsement is included in Brian Nelson’s new book, ” Value Trap: Theory of Universal Valuation”. I’ve read dozens of books on economics, investment theories and biographies. While many are well worth the read, this is truly one of the few books that can be used as a “How to” when it comes to investing. Brian is a former Director of Methodology at Morningstar, Inc. The company that made “Star Ratings” famous for mutual fund investors. As they branched into stock research Brian was instrumental in creating their research methodology. Now he is President of Investment Research for his firm, Valuentum, Inc. The value of the book is two fold. What so many confuse is the difference between a stock’s price and it’s value. The “Efficient Market Theory” (very academic and rather real world useless) states that a stock’s price is its value. But casual observation proves this not to be true as an individual stock’s price may fluctuate by 10% or more in just a single day. Valuation is the process of determining a stock’s value regardless of price. Stocks have a value, primarily based on earnings. Brian’s methodology, while not necessarily simple, arrives at a very solid range for a stock’s value. What does this mean to an investor? Simple. Buy when a stock is under valued. Right? But to do so, one needs an accurate and accepted assessment of value. Deciding a stock is worth $100 a share doesn’t do an investor any good if all other investors feel it’s only worth $80 a share. The second step is the money maker. Knowing when to buy, every value investor has bought a stock only to watch its price languish, or worse drop further testing resolve and patience. We have all also seen stocks continue up in price, when by all accounts they are overvalued. Knowing when to buy and when to sell is key. Brian’s use of momentum is priceless. The Valuentum methodology is something we’ve been incorporating into our investment process at 401 Advisor, LLC for the last several years. If you’d like to find out more give me a call 937.434.1790 or send me an email at bill@401Advisor.com. Mr. DeShurko is a registered representative of Ceros Financial Services, Inc, (Member FINRA/SIPC). Ceros is not affiliated with 401 Advisor, LLC or Fund Trader Pro. The views expressed are those of Mr. DeShurko and do not necessarily reflect those of Ceros Financial Services, Inc., its employees or affiliates. Past performance is no guarantee of future results. The following was written by Jim Kilgore, an Investment Advisor with 401 Advisor, LLC. Jim has been a welcome addition to the firm, adding a financial planning perspective to our practice. If you are interesting in the financial planning process for yourself, contact Jim at: Jim@401Advisor.com. I wish I could tell you I have followed the advice I am about to give, but sadly I didn’t. I am older and a little wiser now in my mid-forties, and I have six kids. I am in the business of helping people with money, and so it is natural for me to take some time to write down some principles I want my children and my clients to learn and practice in their own life. I’d like to make you aware of three things that are derailing people’s ability to save for emergencies, and squirrel away money for their later enjoyment during retirement. Almost every day I run across someone who tells me they don’t have the money to save for retirement after I just watched them spend $8 on a white mocha and a scone from a busy coffee shop. Recently, I engaged a young lady in a conversation for several minutes to find out a little more about her and her spending habits. She goes to that coffee shop almost every day and gets the same thing. Next, I asked her about her lunch plans. She said she usually goes out to a deli or a fast food restaurant to pick up lunch. Having found out that most of her coworkers do the same thing, the wheels began to turn in my head. It caused me to stop and think about the effects this is having on many people’s ability to save money. Do they even know, they are chopping off their own feet? According to a study conducted by the Simple Dollar, the average American spends $232 on meals away from home every month. That dollar figure doesn’t include the swipes at the gas station for a candy bar and a soda, and it also leaves out the regular stops for a mid-afternoon coffee at a high dollar coffee shop. In total the average person spends nearly $500 per month on quick convenience items throughout the month. What could cutting this dollar figure down to say $200 add up to over a long period? Let’s take a look. If you decided you were going to change your spending habits a little and take the monthly expenditure and reduce it to $200 per month over your lifetime, and save the rest in an investment account ($3,600/yr). Saving what equates to your lunch money can add up to a significant dollar amount over time. I can’t tell you all the reasons people give for liking to get a tax return at the end of the year, but it happens all the time. After learning just a little about personal finance several years ago, I realized how silly this is. Many people would not argue that the federal government has severe spending problems. I don’t trust them to use my money in a smart efficient way, and if I have to pay taxes anyway, why wouldn’t I try to hit my tax liability as close as possible each year. Thereby getting the money in my paycheck throughout the year and putting it to use in the way I see fit. According to the IRS, the average income tax return in this country is $2,000. If you average that out, it comes out to about $166 per month you are sending to the IRS for them to use all year at 0% rate of return. Technically speaking you lost money because of the invisible tax called inflation on those dollars. Let’s add that $2000 to the money we were saving from packing our lunch and see how that changes our retirement savings. See the chart below. If this is starting to make sense to you, then you can go to www.irs.gov and use their withholding calculator to help you estimate what you should have your withholding set to so you can pay the right amount of tax each year without giving them free use of YOUR money. If you are not ready to run me out of town with pitchforks yet, this last point will bring the rest of the way. According to nerdwallet, in 2018 the average new car payment was $530 per month and the average used car payment is $381. New cars are great, and they smell good too. Do you know what else is great? Not spending $530 per month on a car every month. I have almost always bought used cars and when you take your time to find one, you can find some great deals. Given the fact that many people have resigned to the fact that a car payment is an automatic this day and age, let’s look at what buying a used car and investing the difference would add to the total. The difference between a new car payment and a used car payment is $149 per month. So, let’s add that total to your already growing savings. That added $1788 per year to your retirement savings and the changes can be seen below. All the ideas I just shared with you, anyone can do. I don’t care if you make $40,000 or $200,000 you can pack your lunch, make sure you don’t send the IRS too much money this year, and make wise car buying decisions. Doing these three things and saving the difference for a long period of time adds up to a significant dollar figure. What if you are already 40 years old and have not started saving for your retirement? There is hope and it is not too late. While the results won’t be as impressive as the chart above, there is no reason to abandon all hope. The chart below shows you what you could save if you started saving at 40. What are some of the ideas you have for increasing retirement savings? Email jim@401advisor.com to share your ideas for possible use in future articles. *Jim Kilgore is a financial planner and investment advisor with 401 Advisor, LLC. 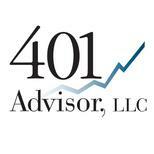 401 Advisor, LLC is a Registered Investment Advisor, with the State of Ohio. The views expressed in this article are those of Jim Kilgore. The crystal ball is a little cloudy this year. With the market and politics seeing more than the normal volatility, predicting what happens in 2019 is not an easy task. In order to take some guesswork out of it, I’ll share a bit of the process I use to assess the economy and markets. 2018 Prediction 1: Below are the projected P/E ratios based on a level 2700 for S&P 500 and consensus projected earnings and earnings growth rates from http://www.YCharts.com. 2018 Prediction 2: In 2018 expect at least one 10% decline through the year, if not more. Do not be scared out. Remember that historically 10% declines are normal every year! Actual: Two 10%+ declines for the year. Actual: At the beginning of the year most feared rising interest rates. I was one of the minority that saw rates declining. The first thing I always do is try and take in the big picture. A great website to do this is http://www.econpi.com. Econ P.I. looks at numerous indicators (go to their website for a full list and explanation), and plots where in the economic cycle we are based on those indicators. Below is a graph from October 2018. In the box above both the MoC and LD boxes have moved from the expansion to the decline quad. While still very solidly in the positive range, further movement toward the contraction quad will likely coincide with another 10% drop. That is not good news for the stock market. Below is a 1-year graph of SPY, the S&P 500 tracking ETF. You can see the big drop that started in October, highlighted by the white declining line. The two parallel white lines highlight a trading range created between October and mid-December. We’ve since crashed and recovered, but seem to be heading for more movement within that earlier range. A sideways market is an indecisive market. At this point (01.25.2019) it is a coin flip as to whether the next trend will develop to the up or the downside. I’ve said it before and I will continue to say it, “It is all about earnings”. Until I see forward earnings estimates adjusted up, and not down, I just see market volatility as the program traders whipsaw the market. Looking at the economic data, it is moving in the wrong direction overall. We won’t hit contraction/recession levels in 2019, but a slow growth environment is not typically one where we see rising earnings expectations either. Strategy matters – predictions do not. All was not lost in 2018, if you had the proper plan. 2018 was brutal. 10% up and 10% down in the spring followed by an upward trending summer and early fall. Then Bam! The third quarter set near term records, and not in the right direction, culminating in a 15% drop in a month. What happened Santa? Suddenly all the new market geniuses created since the election weren’t so smart after all. Simple trend followers were forced to consider that things like earnings and valuations really do matter. Worse, everything was down. Every S&P 500 sector was negative. Bonds were negative. With seemingly no place to hide, what is an investor to do? I recently had a conversation with a client that is going to retire this summer. Their concern was that they couldn’t afford the portfolio loss right before retirement. My response was that even with a loss on their net worth, the income, the dividends paid by their portfolio actually increased substantially in 2018. An investor will not go broke if they can live off their dividends and income. But that is theory. How did it actually work? I did a quick analysis for this client. He owns 24 stocks, with about 30% of the account value in a money market – opportunity money. As the markets decline yields increase, so I have the cash to pick up higher-yielding quality investments later at lower prices to increase his income. Of the 24 stocks held 21 increased their dividend payout in 2018 over their 2017 payout. Two lowered their dividend and one kept it the same. Pretty good batting average. The average unweighted increase in dividends was 11.87%. Meaning the 11.87% assumes equal weighting of all holdings. Since his portfolio is not equally weighted he saw an increase proportional to his holdings, his change in income could have been more or less than 11.87%. So let’s just say +/- 10% on the year. That is a pretty good gain in income anyway you slice it. This why I always talk about having a plan and sticking to it. Plans may not be needed in raging bull markets, but they are the key to survival in bear markets. Our plan looks something like this: Identify high-quality dividend-paying stocks; Identify those selling for under intrinsic value; Identify those with substantial free cash flow to enable them to increase their dividends annually. Part II is to follow our defined macro signals to raise cash as a market declines to create a war chest for buying more at better prices. If you don’t have a plan, if you don’t know where your retirement income will come from, feel free to give me a call or drop me an email. We’ll show you how to navigate these markets without having to dust off the resume in retirement. Happy New Years, and Wishes for Good Returns in 2019! **Client Note: The market has very quickly fallen to levels where our indicators are starting to flash. The fact that they are at this point with what is really a very small selloff is a testament to what can happen very quickly. For portfolio updates and changes please log into the Client Only blog at http://www.401Advisor.com. For a password either call the office for Michelle or send me an email at: bill@401advisor.com. Since the market peak in September it has dropped about 9% through Wednesday October 24th. Remember that based on history, the market will drop 10% once a year, 20% once every three years and 40% or more every ten years. These are averages. The market did not see a 40% drop from 1980 through 1999, but then suffered two from 2000 to 2010. If this dip hits -10%, it will be for the second time this year. Normally at this point I write about this being way too early to read anything into this drop more than the usual volatility, and as I termed it in the spring “a hissy fit”. This time is a little different. While all the bull signs are still in place, there is one very big difference. There is only one thing that ultimately matters to stock investors and that is earnings. And more specifically the direction of earnings. While next year’s earnings will most certainly be positive, expectations are that growth will be about 1/2 of what we saw this year. That is expected and considering the massive boost corporations received from the tax cuts, 1/2 really isn’t so bad. But with reduced expectations comes legitimate worries. At 17% earnings growth (expected for full year 2018), companies can absorb the hits from tariffs, higher wages, higher oil costs, higher interest rates…. But at 8% – 9% growth (expected in 2019) there is far less cushion to absorb the hits to earnings and maintain the growth that goes with current valuation levels. 2019 will be a tug of war between continued economic stimulus from individual tax cuts and the fore-mentioned negatives. Volatility will be back. What does this mean now? Normally I would brush this off. But times aren’t normal. I have alluded to before, and will try and devote a significant blog to the subject, liquidity is drying up. What this means is that when selling starts it can snowball fast. And we have seen a hint of this over the last couple of days. While I think a rebound is probable, if instead we see a continuation of the selling we could be at -20% or more very quickly. This can be a good test to any investment strategy. there will be no second Brexit vote.